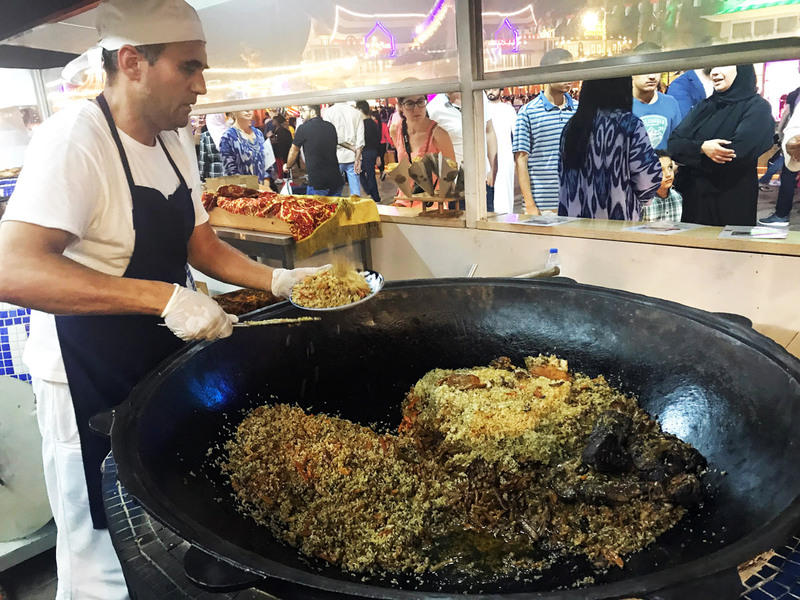 It is a flavour-packed ride at the Global Village this year. With 23 restaurants, cafes and over a 120 food and beverage kiosks offering a variety of cuisines – the village sure makes for a gastronomical delight. From the time you enter the fair you can be sure to find a lot to munch and gorge on. There is food, food and a lot of food everywhere. So we head to the village to try some new street food, cuisines and restaurants. 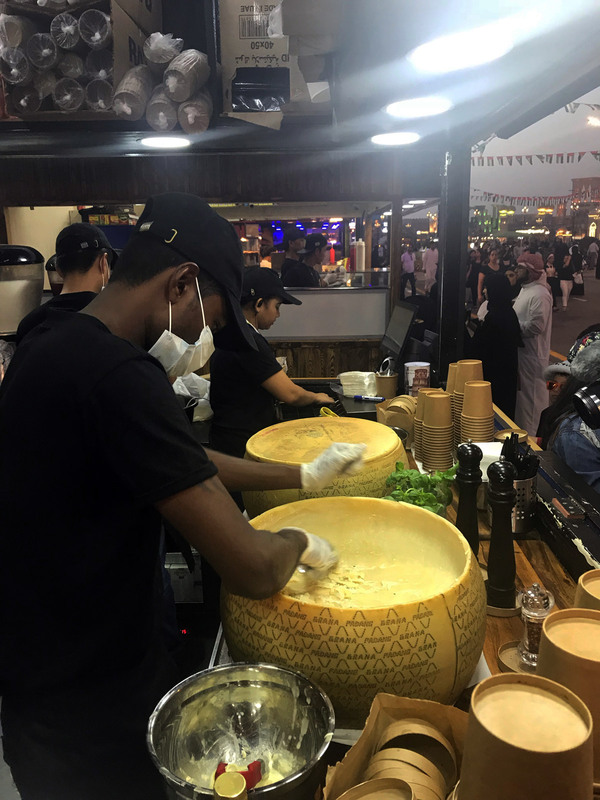 The Cheese Wheel for one is a pop-up at Global Village which dishes out giant portions of pasta straight from a giant wheel of cheese. We were salivating at the very thought of trying this dish. Needless to say the pasta tastes really amazing. There is no amount of cheese which is truly enough and how true is that. 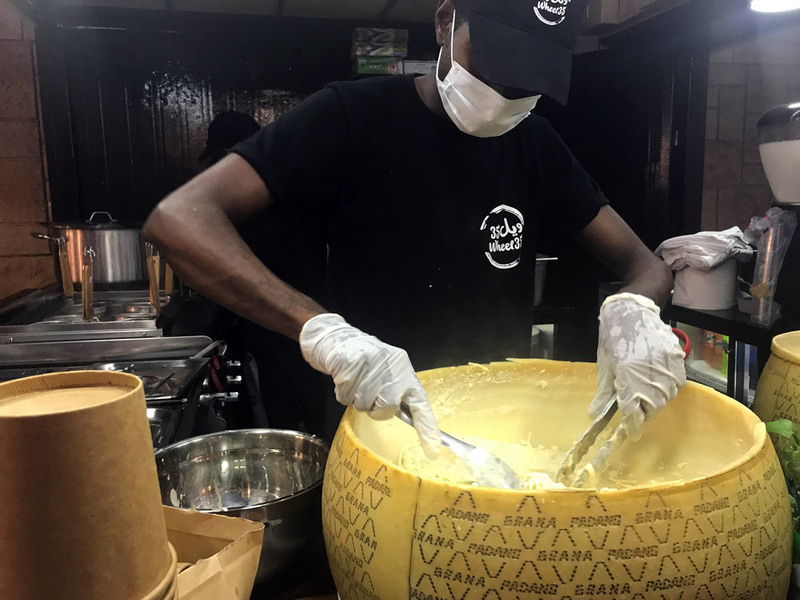 The way it works, through repetitive pasta and cheese mixing, the wheel gets hollow in the middle, making it a perfect bowl for churning the pasta and parmesan. The pasta (costing Dh30 per serving) is served with some truffle sauce. 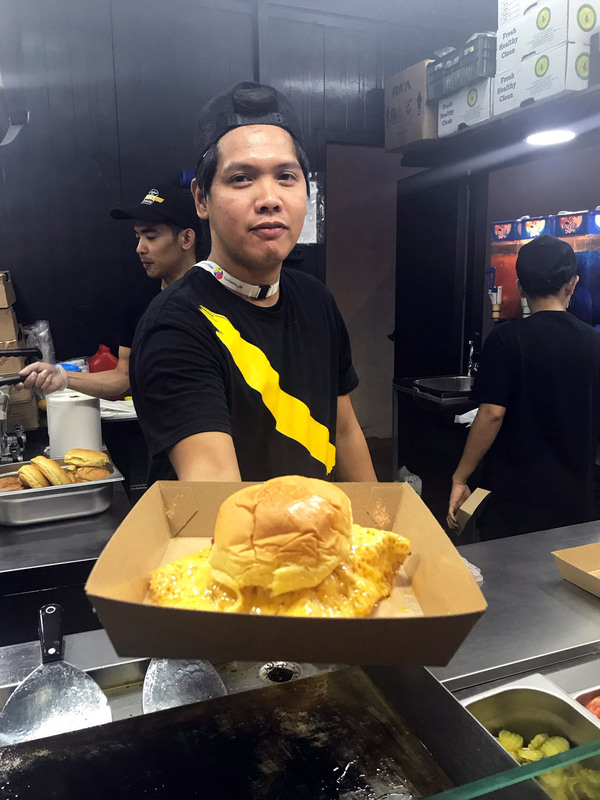 A skirt burger with toppings (priced at Dh25) is made from shredded cheese. The burger is topped with shredded cheese forming a crispy outer skirt. How yummy is that? A must try for sure! Lassi (a popular Indian yoghurt-based drink) lovers can take your pick at this Lassi spot where you can find several varieties and flavours such as berries, mango, strawberry, dry fruit and matka. Price of a lassi is Dh16. Zombie Donuts anyone? 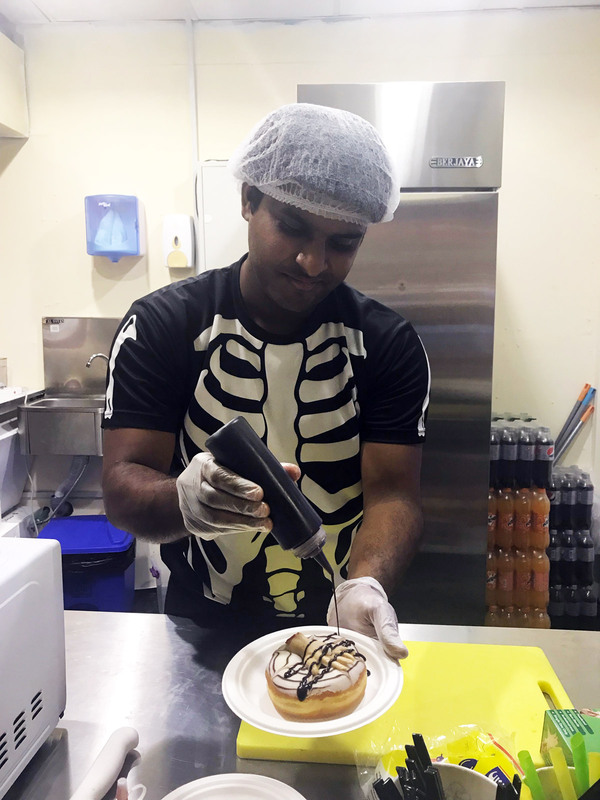 For just Dh10 take a look at some fancy, and rather scary faces on these donuts. It does make for quite an interesting take on donuts. You might have heard of the Leaning Tower of Pisa – bet you haven’t heard about the leaning tower of Mozzarella. Don’t miss this five-story mozzarella tower priced at Dh30. It is truly exquisite. For dinner we headed to a vibrant and pretty-looking restaurant called Punjabi Village. Punjabi Village is set against the backdrop of a typical Punjabi village setting, also called a Dhaba. You will find authentic Punjabi food here, like Sarson ka Saag - a vegetarian dish made from mustard green and spices like garam masala, ginger and garlic, served with a special flat bread called makki di roti made from corn. Another famous Punjabi dish Butter Chicken is a major hit with visitors at the village. The seating is on a 'charpai', or 'charpoy' - a traditional Indian woven bed! 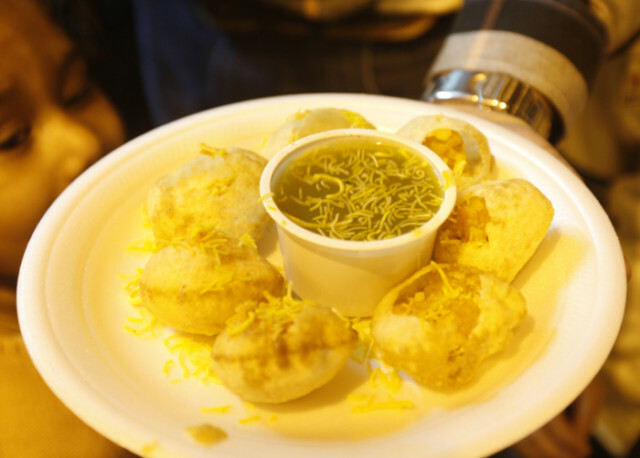 If you know the comfy way you could sink into a seat, that's what you get on a charpai - a major treat after walking through Global Village. The ambience is upbeat to say the least. When you reach the Plov 7, a traditional Uzbek restaurant, you are welcomed into a theatre of cooking. From the food and the hand-painted cutlery, to the ambience – everything is traditional Uzbek here. We tried the samsa and the plov – the dish the restaurant has been named after. You would be surprised at how these authentic Uzbek dishes have som much in common with other cuisines. The samsa is really an Uzbek version of the popular samosa (or sambusak) and plov is similar to what Indians and Pakistanis call pulao. 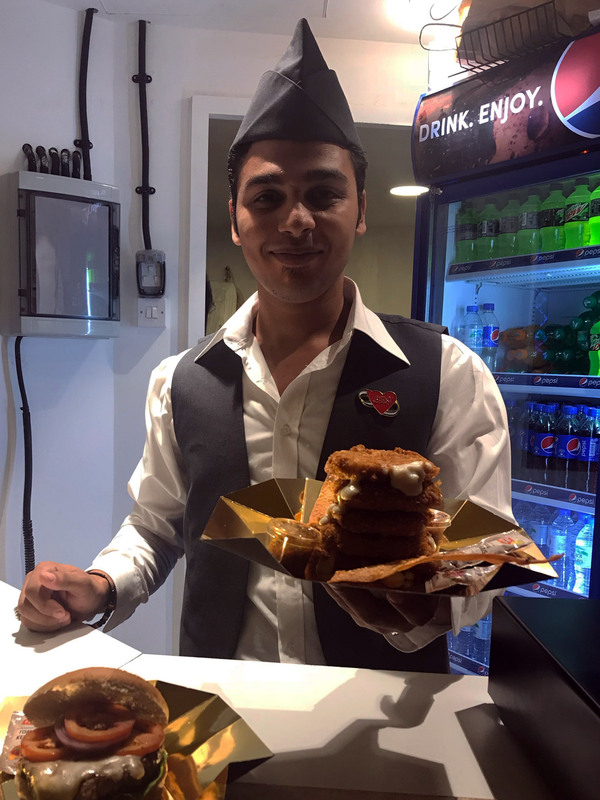 Their bread has a distinct Uzbek flavour and we found it quite refreshing to try this new cuisine. Our culinary ride came to an end at Plov 7. Sitting on a topchan, we sipped on some traditional Uzbek tea. We were totally taken in on the ambience from the top of the restaurant. With a 360-degree view of the Global Village this is the best place to catch the fireworks.